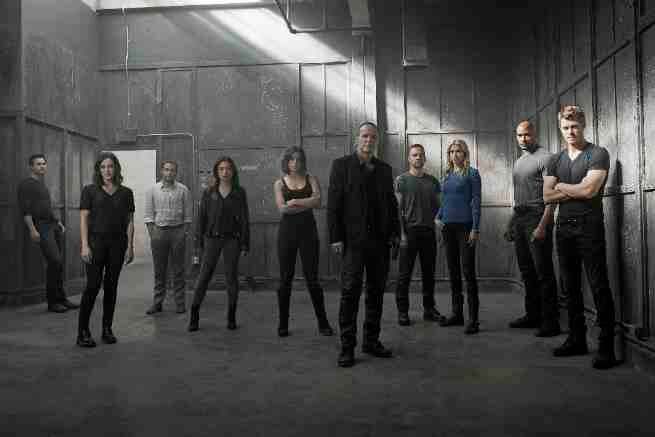 Marvel and ABC have released several new promotional images of the cast of Marvel's Agents of S.H.I.E.L.D. for Season 3. Marvel's Agents of S.H.I.E.L.D.stars Clark Gregg as Director Phil Coulson, Ming-Na Wen as Agent Melinda May, Brett Dalton as Grant Ward, Chloe Bennet as Agent Daisy Johnson, Iain De Caestecker as Agent Leo Fitz, Elizabeth Henstridge as Agent Jemma Simmons, Nick Blood as Agent Lance Hunter, Adrianne Palicki as Agent Bobbi Morse, Henry Simmons as Agent Alphonso “Mack” MacKenzie and Luke Mitchell as Lincoln Campbell. On the Season 3 premiere episode, “Laws of Nature,” when Coulson and the team discover a new Inhuman, S.H.I.E.L.D. comes face to face with another organization searching for powered people. And still reeling from Simmons’ dramatic disappearance, Fitz goes to extreme lengths to try to learn how to get her back. Marvel's Agents of S.H.I.E.L.D. Season 3 premieres Sept. 29 on ABC.